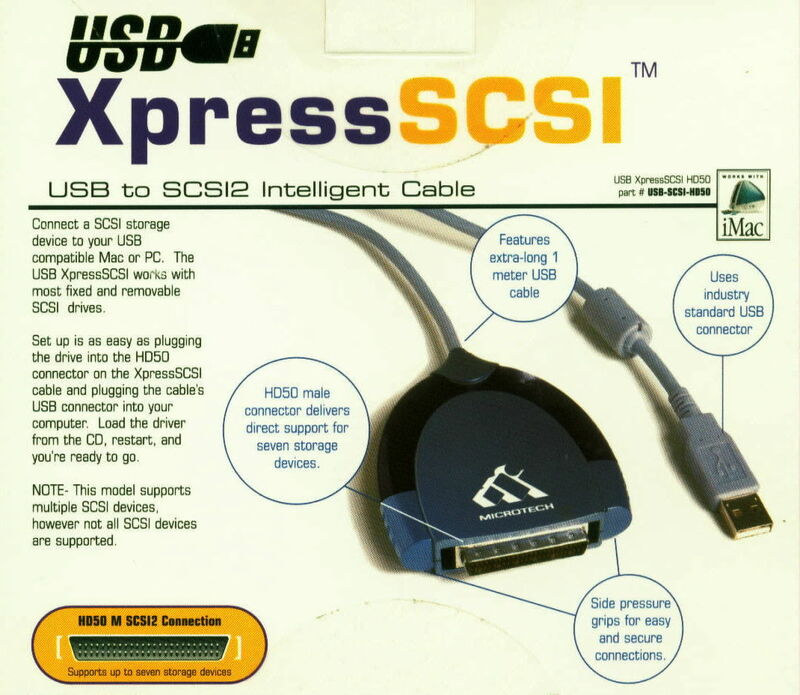 The USB XpressSCSI is a USB to SCSI Converter for new iMac, G3 (blue and white), G4, or Windows 98, Me, 2000 or XP PC owners who wish to use existing SCSI peripherals such as hard drives, and CDR. 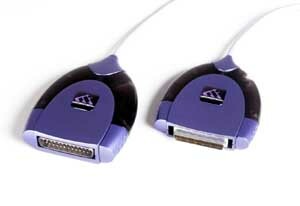 The converter is designed as a cable with a standard USB connector on one end, and either a SCSI DB25 female or HD50 male connector at the other. The SCSI connector is attached to the external device and the hot-swappable USB connector is plugged into the CPU or hub. The connector supports up to 7 devices in true plug and play fashion, recognizing devices on the fly without requiring users to restart the computer. The USB XpressSCSI is fully compliant with USB spec version 1.1, and delivers a maximum data throughput rate of 1.2MB/sec. The first release of the software driver for the converter will support storage devices including SCSI hard drives and most removable media solutions. Microtech also promises an ongoing development schedule for driver updates and expects to support scanners and other third party devices in upcoming revisions. Driver upgrades will be free of charge and available for download from the Microtech Web site. Article #1: Crabb: Instant Review: "USB to SCSI and Back Again". Article #2: More Info on the USB to SCSI Connection, by Don Crabb. Supports most SCSI storage devices such as Syquest, Jaz, and external hard drives. This model is not recommended for SCSI scanners which are trickier to connect. For Mac OS 8.5 or Windows 98, Me, 2000 & Win XP. No support for Windows 7 & Vista. WARRANTY & SUPPORT. Tech support from manufacturer and PSI. For tech support and/or RMA, please go to http://www.psism.com/support.htm. TO ORDER OR INQUIRE. Please click here to place an online order or send e-mail inquiry to sales@psism.com or call (301) 572-2168. We accept Visa, MasterCard, Discover and American Express as well as government and university POs. International orders may be conditionally accepted. Please click here to order or view our ordering information page. 2963 Mozart Drive, Silver Spring, MD 20904 U.S.A.